It is CRUCIAL to keep as many things native to Messenger as possible to give your customers the best experience. If they want to sign up for your webinar, they should be able to enter their email addresses within Messenger. If they want to talk to a customer service representative, they should be able to reach someone within Messenger. If you want to exclude people from a Messenger broadcast, your CRM should automatically update the tags so you don’t send buyers info they don’t need. A few months ago, some of these features weren’t possible and with the recent Zapier integration with Manychat… all of these use cases (and more) can be accomplished. Imagine asking your customer through Messenger to sign up for your live webinar. Instead of clicking a button, going on your landing page, entering their email, and so on… Zapier allows the user to type their email address within Messenger. Manychat works with Zapier to “zap” that email address to your CRM (like Infusionsoft), and Infusionsoft can send your customer a welcome message to that email. 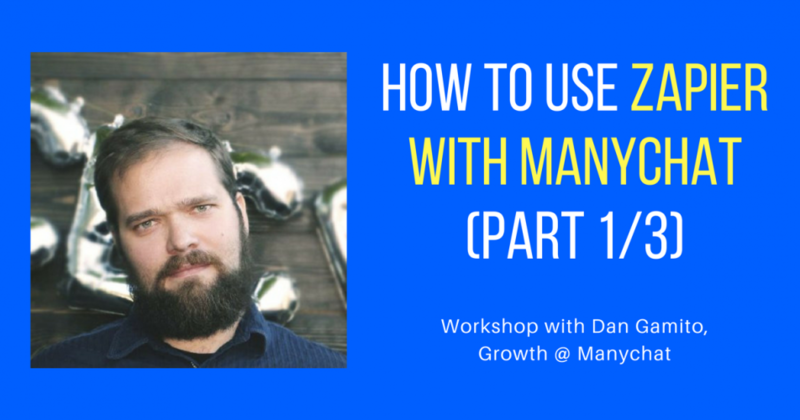 That is one of many use cases we cover with the workshop we did with Dan, who runs Growth at Manychat. We spent an hour going over use cases, important things to know, and showing step-by-step instructions on what you need to do to get started. Part 1 (this post) describes at a high level why businesses need to use Zapier with Manychat. Think of a 60,000 feet view on the future of integrations with Facebook Messenger! Part 2 (you can find that post here) describes practical use cases with step-by-step instructions on how to integrate Zapier with Messenger. We collect email addresses and export it to Webinar Jam + Mailchimp – and test it live getting the welcome email from each CRM. As well as connecting Stripe, Infusionsoft, and other softwares – super powerful. Part 3 (exclusive to our Messenger subscribers – get this post here) is the 30 minute Q&A where 50+ attendees ask Dan on more advanced things you can do. We get super specific on the nuances you need to know as chatbot creators. Watching this part will save you hours of time in the future when you get stuck.